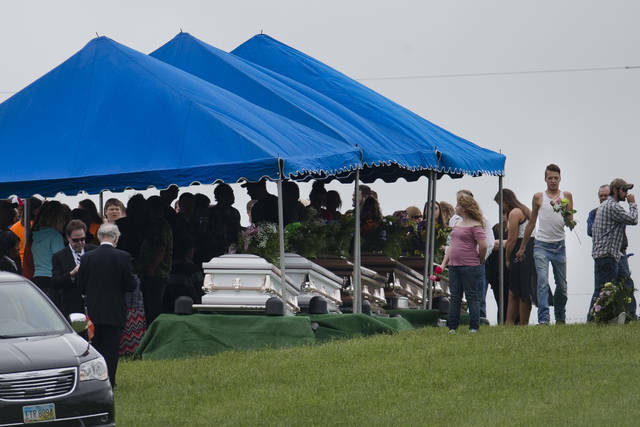 FILE – In this May 3, 2016, file photo, mourners gather around caskets for six of the eight members of the Rhoden family found shot April 22, 2016, at four properties near Piketon, Ohio, during funeral services at Scioto Burial Park in McDermott, Ohio. The Ohio Supreme Court has sided with a newspaper seeking to view autopsy reports and photos in the still-unsolved slayings of the eight Rhoden family members. The court ruled unanimously Wednesday in favor of the Cincinnati Enquirer, saying Ohio law allows reporters to view preliminary autopsy and investigative notes and findings, and photographs. COLUMBUS (AP) — Reporters on Wednesday viewed preliminary autopsy reports in the still-unsolved slayings of eight Ohio family members in one of the state’s most notorious crimes, following a decision by the Ohio Supreme Court. The reports provided few new details. The court ruled unanimously in favor of the Cincinnati Enquirer, saying Ohio law allows reporters to view preliminary autopsy and investigative notes and findings, and photographs. The law governing the viewing of the information is clear, the court said in overturning a lower-court decision. If “a journalist submits a proper request to review preliminary autopsy and investigative notes and findings, suicide notes, or photographs of the decedent made by the coroner, the coroner ‘shall’ grant the request,” the court said. The still-unsolved case involves seven adults and a teenage boy from the Rhoden family who were found shot to death at four homes in Piketon in southern Ohio in April 2016. The Attorney General’s Office, which is investigating the killings, made single-page reports for each victim available for inspection Wednesday morning. Under Ohio law, reporters can only view the information and are prohibited even from taking notes. No photos were released. The report for victim Christopher Rhoden Sr. said he was shot nine times and notes without explanation that his body was decomposed “more than all the others.” The bodies were all found the morning of April 22, 2016, with the shootings believed to have taken place hours before. Heavily redacted versions of the reports released in 2016 showed all but one of the victims were shot multiple times in the head. Toxicology results, which could include the use of drugs or alcohol, were blacked out for all the victims. Evidence of injuries beyond the mention of gunshot wounds was also blacked out for all the victims. The Enquirer’s lawyer said the court made the right decision. “This is a case that is now over two years old, unsolved, and I think the investigators deserve to be scrutinized,” said attorney Jack Greiner, an expert in public records law. The high court previously ruled against releasing the autopsies as public records. Wednesday’s decision was decided under a different law that specifically regulates inspecting the records. The victims were Christopher Rhoden Sr., 40; his ex-wife, 37-year-old Dana Rhoden; their three children, 20-year-old Clarence “Frankie” Rhoden, 16-year-old Christopher Rhoden Jr. and 19-year-old Hanna Rhoden; Frankie Rhoden’s fiancee, 20-year-old Hannah Gilley; and a cousin, 38-year-old Gary Rhoden. Three children were found unharmed. The last victim to be discovered, 44-year-old Kenneth Rhoden, who was the brother of Christopher Rhoden Sr., died of a single gunshot. Authorities suspect there were multiple attackers who were familiar with the victims’ homes and the surrounding area, about 70 miles south of Columbus. The office of Attorney General Mike DeWine has said Christopher Rhoden Sr. had “a large-scale marijuana growing operation,” leading some to speculate the killings were drug-related. https://www.limaohio.com/wp-content/uploads/sites/54/2018/09/web1_121398164-098d9f15611a48cd90df58ecd7a5de97.jpgFILE – In this May 3, 2016, file photo, mourners gather around caskets for six of the eight members of the Rhoden family found shot April 22, 2016, at four properties near Piketon, Ohio, during funeral services at Scioto Burial Park in McDermott, Ohio. The Ohio Supreme Court has sided with a newspaper seeking to view autopsy reports and photos in the still-unsolved slayings of the eight Rhoden family members. The court ruled unanimously Wednesday in favor of the Cincinnati Enquirer, saying Ohio law allows reporters to view preliminary autopsy and investigative notes and findings, and photographs.